As I write this blog post I’m excited to report that after months of work my book is finally being published on Friday. Half way through developing the manuscript I changed the title to #Upcycle Your Job and the more I worked with that the more sense it made to me. Upcycling has been a growing trend in the past few years. When we upcycle we take something we would otherwise discard and improve it to create something of higher quality or value than the original. If we can do that with our clothes and furniture why not with our jobs? in line with their flexible working practices. Re-designing jobs will soon become a necessity as we move into the age of Artificial Intelligence and the Gig Economy. And when we focus on the notion of improving rather than simply redesigning we become more creative and end up with work that’s more valuable to our organisations. The result is upcycled jobs that fit our 21st century working lives. Occupational Psychologists have known for years that the size and shape of jobs has an impact on wellbeing. Unfortunately it’s an increasingly negative impact as employees struggle to disconnect from mobile technology that keeps them constantly tied to work. For many women the situation is exacerbated by employers who agree to reduced hours working but fail to provide any guidance on how the job might be redesigned to accommodate this. Having people working on unproductive tasks until they are exhausted is not a sound business strategy. When we upcycle jobs we focus on high value outputs that use our most valuable skills. It’s not a new idea but one to which I was first introduced (via the Work Out process) back in the 1990s when working for GE. It’s unlikely you’ll be doing anything new. There’s plenty of evidence that employees already engage in crafting their jobs to make best use of their skills and personalities. There’s also evidence to suggest job crafting enhances wellbeing. The intersection where your work-life balance preferences and your flexible working arrangement meet is personal so you’re the best person to upcycle your job accordingly. Running around with too much to do and little focus will only result in exhaustion. It won’t get you promoted. What will is an upcycled job that supports you to achieve the key tasks for which you were hired. This month I invite you to become the Balanced Leader of your own life; and let my book show you how to #Upcycle Your Job. When it comes to finding better balance in our working lives it transpires Artificial Intelligence could be our ally. For some time the doomsters have been predicting widespread job losses as technology takes over, but according to a new book published by Harvard Business Review the reality is more nuanced. I recently attended the London launch of a new book that explains how automation will reinvent rather than eradicate jobs. Co-author Ravin Jesuthasan introduced a four stage approach to recreating jobs with the aid of Artificial Intelligence. It starts with deconstructing the job to identify tasks best suited to automation; then identifying the automation payoff and what automation is possible; and finally reconstructing the job to create the best human-automation combination. It’s a great book, thoroughly researched and well worth reading. For those of us looking for more balance in our work it also offers a new tool to help bring that about. According to the authors tasks which are repetitive, carried out alone and requiring physical rather than mental energy are best suited to automation. Which leaves humans to do more of what they do well: use their creativity – often in collaboration with others. Eliminating low value, routine tasks which can be automated is something I’ve been advocating for years. It’s particularly important if we want to work less than full time. It can eliminate all those routine, low value tasks that eat into our working day. For example – as I recently speculated on LinkedIn – imagine an algorithm that could work out which of those emails in your inbox was really necessary and somehow eliminate the rest. So that even if you feel the need to check emails out of hours you would be confident those emails were important. Or a readily accessible and easy to navigate knowledge bank where your co-workers could find the answers to simple questions rather than interrupting your precious non-work time. Reducing the average email load may also reduce the temptation to work during our commute. That would both provide us with recovery time and help us create better boundaries between our work and non-work lives. And removing the constant distraction of low value activities could result in us having more focus while working fewer hours – so we become more productive. Higher value creative tasks tend to be more open-ended; and since human beings don’t switch creativity on and off it might actually become more difficult to separate work and non-work lives. Working collaboratively in a global environment could result in team members being at the mercy of other people’s timings and preferred ways of working. Managing the challenges elegantly will require both better collaboration skills and better self-management. Deconstructing and recreating jobs without a specific focus on human well-being could simply result in jobs that are more stressful. And job redesign – while it does open up new possibilities as the book authors demonstrate – will not, in itself, change outdated workplace cultures that emphasize long hours and presenteeism. As human beings we can choose how technology will support us to create a better working future. We currently appear to be making some very poor choices given our increasing propensity to be #AlwaysOn. But we can be more mindful, making better choices that create better working lives. And in doing so we find Artificial Intelligence has become our unlikely ally. The word flexism may not have made its way into the dictionary yet but the concept has been around for several years. It refers to the unconscious bias held against those who work flexibly (and often less than full time). It raised its head again last month as research findings released by the social enterprise Timewise suggested it was rife in the workplace. Flexism impacts behaviour in both overt and covert ways. The Timewise report gave examples of the former: reduced hours workers feeling their input is less valued and that colleagues don’t see them them as a full member of the team. In addition, as they often have less opportunities to socialise with colleagues they can also feel less connected to them. Covert flexism manifests itself as the unspoken assumptions often held by managers that reduced hours workers are less interested in development and stretch assignments; that their focus is on family rather than career. If you want more balanced working how do you face down flexism? Start by changing the conversation. Rather than explaining the reasons for your reduced hours in terms of caring responsibilities; make it clear that this is a conscious strategy to keep you and your skills in the workplace. Focus on the contributions you are making in your job..
Look for opportunities to let your manager know you’re still keen to progress and to take on stretch assignments. Remind him that you’re willing to explore how it might work in practice. Since you’re the one working non-standard hours the reality is that it’s down to you to create opportunities to socialise and connect with colleagues. Make use of available technology such as intranets; or suggest socialising at lunchtime rather than after work. You may be surprised at how positively your suggestion is received..
You’ve had the courage to ask, now think about how you can influence the thinking of others. Could you start a conversation with your colleagues to explore the benefits of flexible working for them? There’s mounting evidence that men are also looking for balanced working. They want to be involved fathers; and many are also carers of adults. And they too are aware of the subtle flexism rife in organisations. If you open up a discussion who knows where it may lead. Above all else remain confident of your skills and who you are. You get to define yourself, not other people. Define yourself by your contribution and not your limitations. Becoming a Balanced Leader challenges us to hold a vision of living a balanced life as the foundation for our plans and actions. To succeed we need strategies and tools that work for us; together with a map to point us in the right direction. Over the past few months I’ve been pulling my expertise into a structured model which serves to do exactly that. On the eve of National Work Life Week if you’re in the UK and Work Family Month if you’re in the US I’m sharing that model. I chose the acronym PROPEL as I know that following my model can literally propel your career to new levels. P is for preferences in the way we choose to manage our work-life balance. While some of us are avid integrators others feel uncomfortable as technology and corporate expectations push us further and further in that direction. These are the separators who prefer to keep firm boundaries between work and the rest of life. R is for the roles we play and the ways in which we play them. We begin to understand we have choices and that role scripts can become outdated. We can focus on combining roles in ways that enrich our lives and reduce the conflicts we may feel. When we work through these first two steps we become much clearer on how we want to structure our lives and manage our boundaries. We can then begin to explore possibilities for redesigning our work. O is for the options open to us within the culture and practices prevalent in our workplace. While some cultures openly embrace working from home others frown on reduced hours at senior levels. Gently pushing the boundaries of what’s currently acceptable is more likely to succeed than proposing radical changes that make people feel uncomfortable. P is for possibilities. For considering how we can craft our work role to make the most of our key skills. So we become an even more valuable asset to our employers; and more productive and efficient into the bargain. E is for the essential skills we need to make a success of all this. Many of these skills will already be in our portfolio – we may simply need to upgrade them. A small number – such as job crafting – may need to be learnt. The good news is that these are the same essential skills we’ll need to be successful leaders in both our workplaces and our lives. L is for the leadership qualities we’re cultivating and the Balanced Leader we’re becoming. So there it is: the evidence based road map to becoming a Balanced Leader. Straightforward, easy to understand and built on twenty five years expertise! When I recently registered a new coaching client she told me she knew she was holding herself back. Her bosses think highly of her and she’s been encouraged to go for promotion. But she was reluctant – because she couldn’t see how to retain any semblance of work-life balance if she progressed into middle management. After three sessions with me – and only seven weeks later – she’s a changed woman. She’s now firmly committed to renegotiating her current role for more flexibility. And to progressing her career on a more flexible basis. Naturally I’m delighted to have provided her with tools and strategies that opened more options than she’d previously imagined. I’d like to say: “result, job done” but she and I both know that’s not the case. We know she’s at the start of her journey. She’s joined the army of female pioneers setting a new workplace agenda. And she’s consciously undertaking that role in what is an aggressively traditional workplace culture. She understands that she’s laying herself open to scrutiny and criticism. However, we’re both confident she’s not opening herself to failure. Before she begins renegotiating her working arrangements we’ve spent time identifying her value to her employer; and the high potential cost of losing her. We’ve identified the key stakeholders she needs to influence. And as she comes from a project management background managing stakeholders is a key strength for her. We’ve evaluated various flexible working options – including reduced hours, job-share and job-split – and considered both the benefits and downsides of each. We’ve pinpointed her key strengths and identified areas where she needs to upskill. So far we’ve already spent six hours talking about how she might craft a Quality Flexible Job for herself. 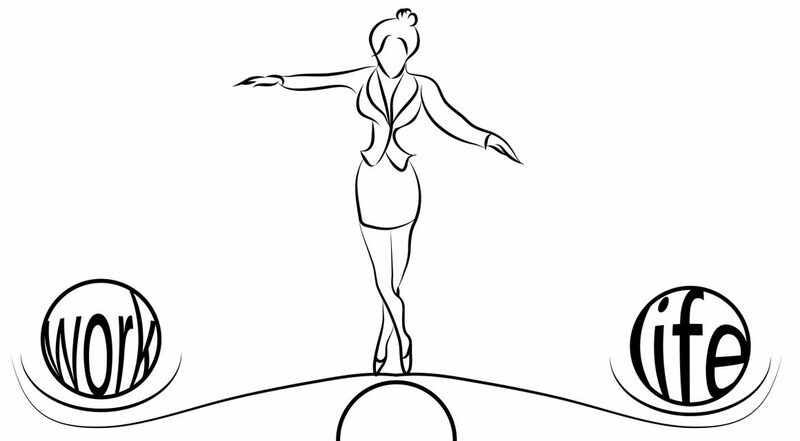 One that supports balance while making the best use of her skills on her employer’s behalf. It’s a considerable investment in time given the busy pace at which many of us work these days. We’re certain it’s time well spent. We’re not finished yet. When we meet again we’ll be planning how to mitigate any potential risks. Identifying small gradual steps that make up the journey to Balanced Leadership. As they say: “forewarned is forearmed”. I mentioned last year that one of my favourite maxims is “the unit within the system with the most responses controls the system”. With my support she’s developing a range of responses, identifying small changes and making course corrections as she goes along. And that’s our winning strategy. The skill of job design has always been part of the Occupational Psychologist’s portfolio but in recent years it’s been taken a step further with the notion of job crafting. In an article in the June 2010 issue of Harvard Business Review Professor Amy Wrzesniewski and her colleagues describe how job crafting enables people to re-energise and re-imagine their work life and provides them with a greater feeling of control at work. At senior levels job crafting makes a great deal of sense. When we devote many years to developing our career we also develop a unique portfolio that’s the sum total of our skills, interests, experiences and workplace encounters. It’s that unique combination that makes us valuable in our jobs and literally irreplaceable to our employers. Think about it. If you quit your job how long will it take to find someone else with your experience? I’m not talking simply about the academic qualifications you have and the professional training you’ve undertaken. I’m also thinking of the specialist knowledge you’ve developed at your workplace and your understanding of how to make things happen in your organisation. So, rather than lose talented women struggling with work life balance job crafting offers employers a way to retain them. The HBR article focuses on assessing and altering three core aspects of work: the tasks, the relationships and our own perceptions of our work. On the Balanced Leader Programme we follow this outline to craft jobs that better support our needs while meeting our employers’ expectations. We begin with the tasks – by clarifying the key things you’ve been hired to do; and the outcomes best suited to your skills. We then consider which tasks can be discarded so that you find the time and space to operate more strategically. In our VUCA business environments the nature of jobs can change pretty quickly. How often do we stop to ask ourselves: “what’s the best use of my time and skills? Where does my best value to my employer lie?” Once we’ve identified working priorities we can assess the potential for time and location flexibility within them. And so we create opportunities to combine work and caring responsibilities in more balanced ways. Then we turn our focus to relationships and identify those stakeholders – both at work and at home – key to our success. And we develop strategies for managing those relationships effectively. As we do this so our perceptions change. We no longer see ourselves as ambitious women constrained by corporate glass ceilings. Like our mothers and grandmothers before us we’ve become pioneers remodelling the workplace for our own benefit and that of future generations.